2008년 일본 암염구회 병원 증례입니다 (Nagano. Gastric Cancer. 2008). 증례 1은 SM1 invasion이 있던 curative resection이었지만 SM involvement가 비교적 현저하여 ("the infiltration in the submucosal layer was relatively wide") 수술을 하였는데 level 2 림프절 전이가 있었습니다. 증례 2도 SM1 침윤이 있던 내시경 완전절제 예인데 2년 후 CT에서 림프절이 커졌고 수술하였더니 level 1 림프절이 커져있었습니다. 2010년 일본 암연구회 병원 증례입니다. 엄밀히 말하면 ESD 후 recur한 예는 아니고 처음부터 림프절 전이가 있었던 예입니다. Expanded indication에 해당하는 undifferentiated type EGC에 대하여 curative resection을 하였으나 림프절 전이가 있었습니다 (Hirasawa. Gastric Cancer. 2010). 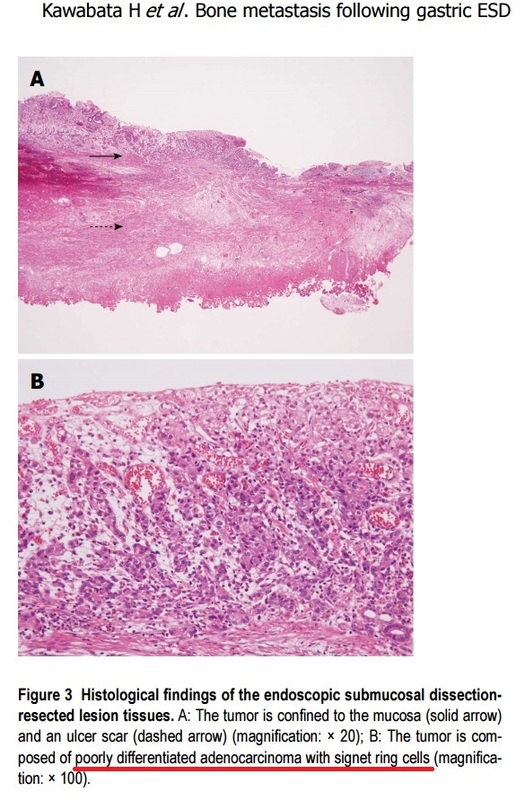 13mm mixed type이었습니다 ("a poorly differentiated adenocarcinoma and signet ring cell carcinoma confined to the mucosa without lymphatic-vascular capillary involvement or ulceration"). Routine ESD 병리검사에서 lymphatic invasion이 없어서 엄청 추가 cut를 해 보았더니 그제서야 lymphatic involvement를 발견했다는 것이었습니다 (" 60 additional deep-cut sections from the resected specimen were performed, with one section showing lymphatic involvement in the mucosa on hematoxylin and eosin staining"). 2013년 일본 Kitasato 대학 증례입니다 (Murakami. Gastric Caner 2012). 시술전 poorly differentiated였는데 4년 후 위암 재발로 사망하셨습니다. 2013년 일본 동경암센터 증례입니다 (Kawabata. World J Gastroenterol. 2013). Non-curative resection (poorly differentiated, 50 x 25 mm, mucosa, existence of an ulcer finding) 이었고 수술을 거부하여 추적관찰하였는데 8년 후 척추전이가 발생하였습니다. 그런데 제가 증례를 꼼꼼히 읽어보니 병리가 mixed type이었습니다. 오른쪽 사진 설명을 보면 "poorly differentiated adenocarcinoma with signet ring cells'로 되어 있습니다. 섞여 있으면 나쁩니다. 순수한 것이 더 좋습니다. 2014년 여의도 성모병원 증례입니다 (Kim DJ. 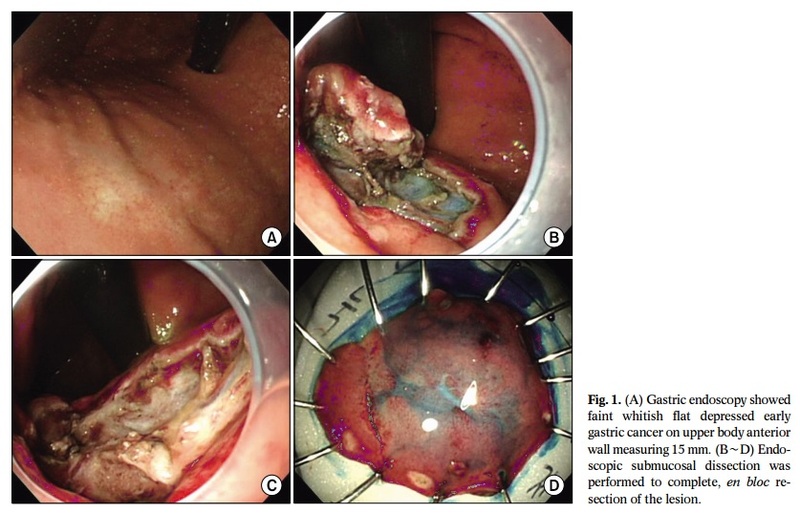 Gastric Cancer 2014). Absolute indication이었는데 1년 후 common hepatic artery 근처 림프절 (LN8) 전이가 있었습니다. 2015년 강릉아산병원 증례입니다 (Han YH. Clin Endosc 2015). Differentiated-type이 주를 이루면서 undifferentited-type인 signet ring cell carcinoma가 15-20% 섞인 경우였습니다. 19개월 후 간전이가 발견되었습니다. 2015년 일본 동경암센터의 증례 보고입니다 (Shirahige. WJG 2015). ESD 후 추적관찰 도중 metachronous cancer가 발견되었고 조직검사에서 poorly differentiated adenocarcinoma였습니다. ESD를 하였고 깊은 점막하침윤을 보인 adenosquamous cell carcinoma였습니다. 수 개월 후 간전이가 발견되었다고 합니다. 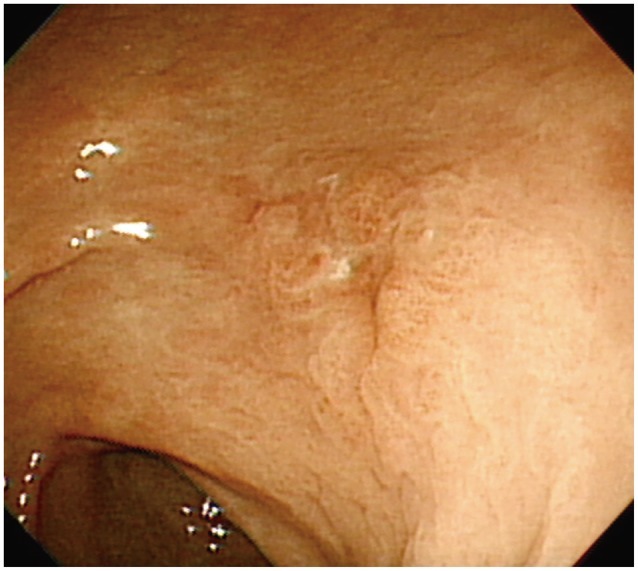 Initial early gastric cancer lesion in June 2005. 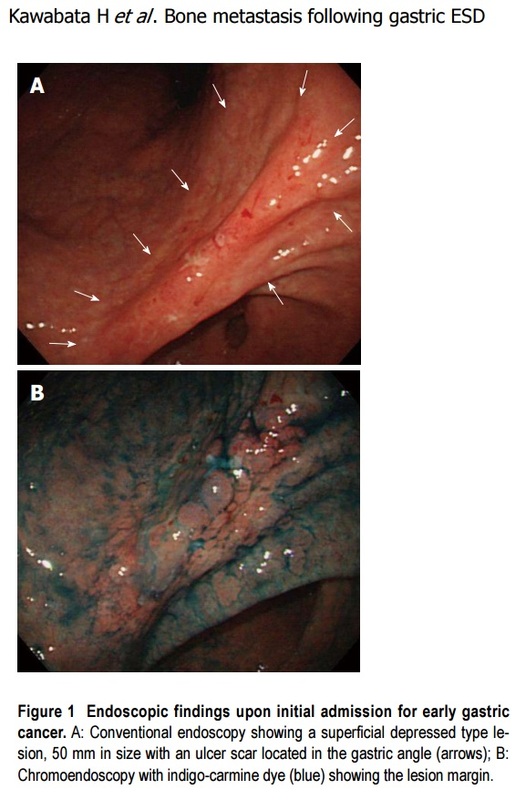 A: 0-IIa type well differentiated adenocarcinoma limited to the mucosa, 10 mm in size, without an ulcer scar, on the lesser curvature of the middle gastric body; B: Histopathological findings revealed a well differentiated mucosal adenocarcinoma, 10 mm in size, without lymphovascular involvement or ulcerative finding, as well as tumor-free margins. 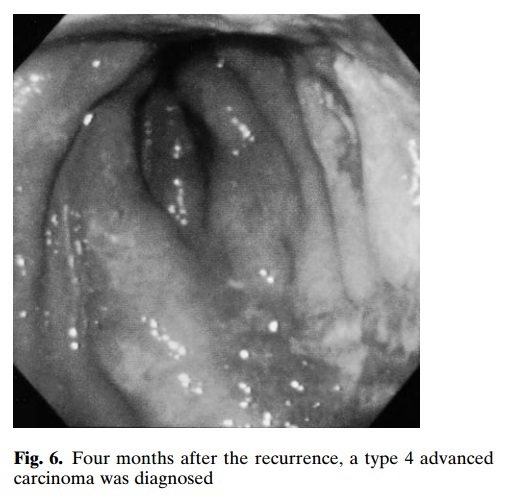 Metachronous early gastric cancer lesion in November 2007. 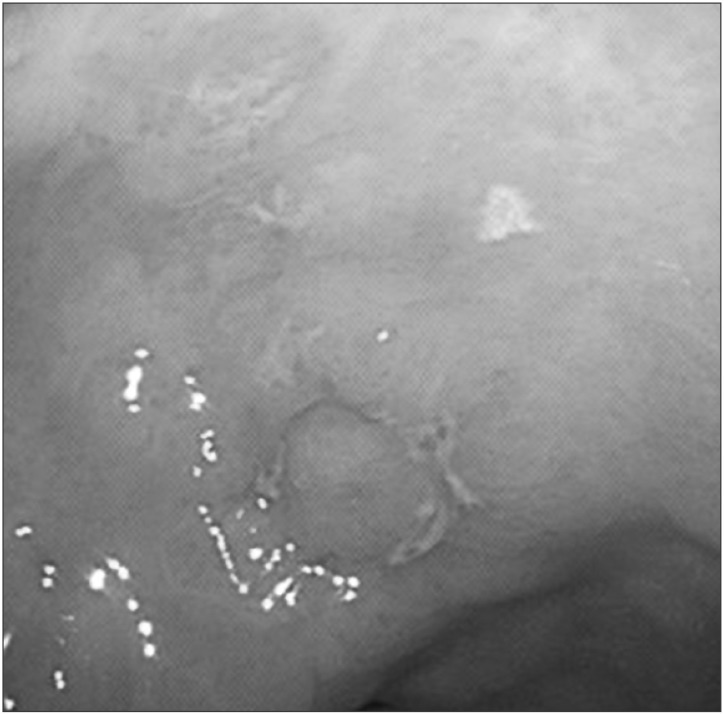 A: 0-IIc type metachronous early gastric cancer lesion, 8 mm in size, without an ulcer scar, on the greater curvature of gastric antrum. The estimated tumor depth was up to the mucosa; B: Biopsy revealed well and poorly differentiated adenocarcinoma (hematoxylin-eosin staining). 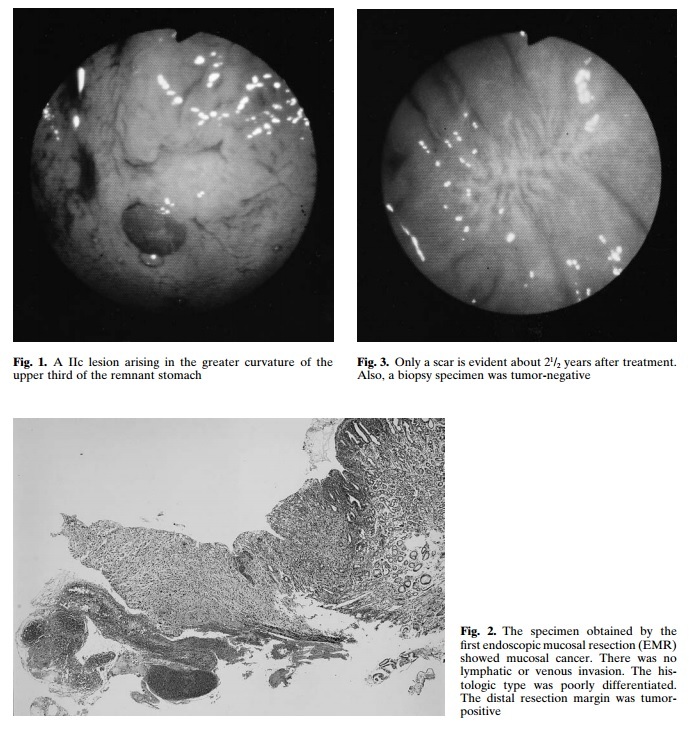 Histopathological findings of endoscopic submucosal dissection specimens. A: Low magnification view with hematoxylin and eosin staining. 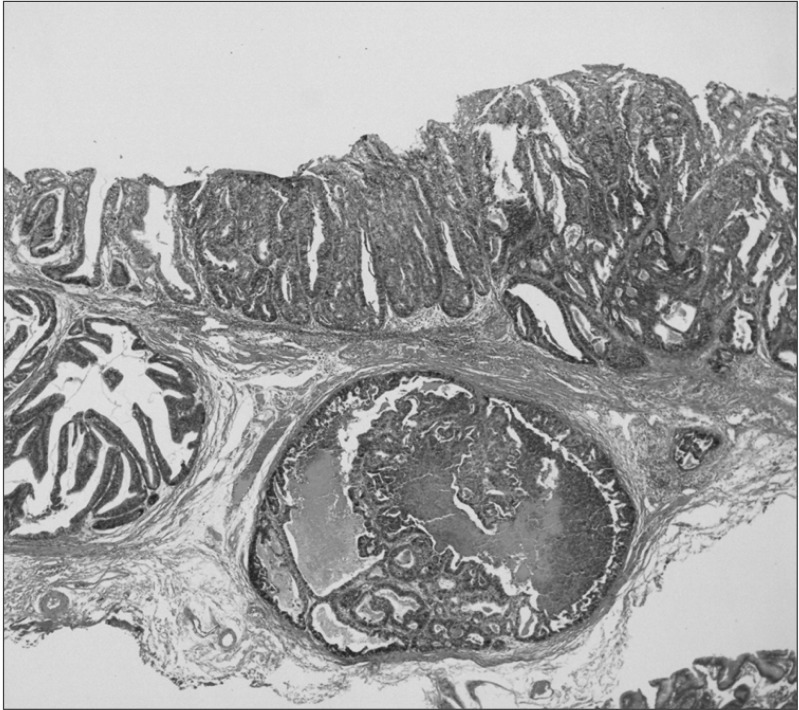 Endoscopic submucosal dissection specimen revealed adenosquamous carcinoma invading the deep submucosal layer (1600 μm); B: High magnification view of yellow box in A. The tumor shows a solid growth pattern and prominent keratinization suggesting squamous cell carcinomatous component. 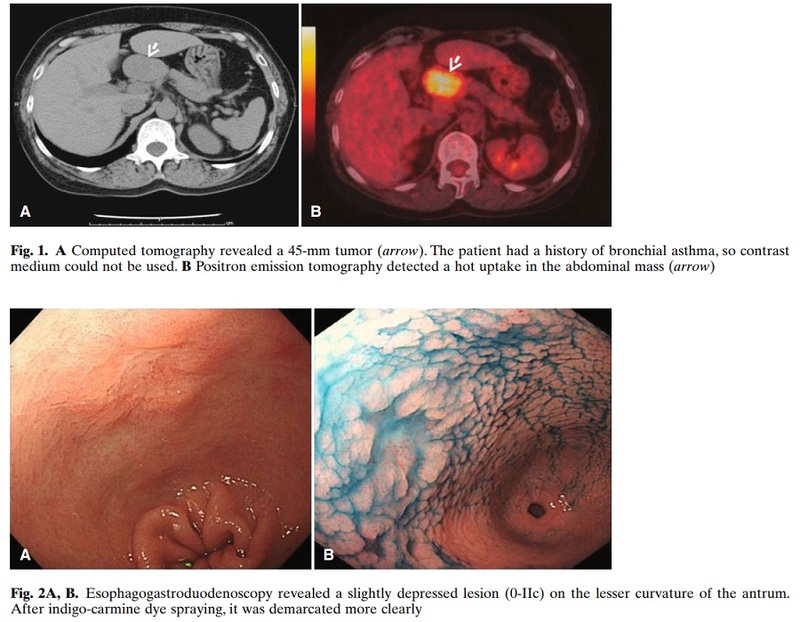 Computerized tomography in January 2008 (two months after the endoscopic submucosal dissection). A and B: Enhanced computerized tomography revealed multiple low density areas suggesting liver metastases (indicated by arrows). 2008년 증례를 왜 2015년에 와서야 발표했는지 알 수 없었습니다 (Shirahige. WJG 2015). 조직검사가 poorly differentiated였는데 ESD를 한 것도 저로서는 못마땅한 일입니다. 2015년 해운대 백병원 증례 보고입니다 (오성진. 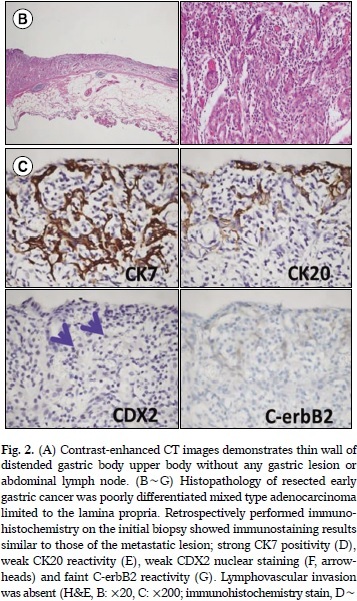 J Gastric Cancer 2015). ESD specimen에서 deep SM invasion으로 수술을 하였으나 간전이를 보였습니다. Esophagogastroduodenoscopy showing a small superficial elevated lesion in the antrum of the stomach. 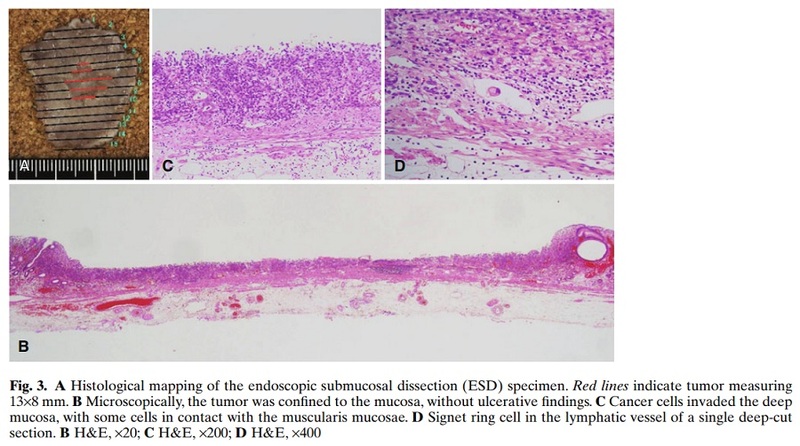 Histopathological examination of the specimens resected by endoscopic submucosal dissection revealing tubular adenocarcinoma with submucosal invasion (H&E, × 40). 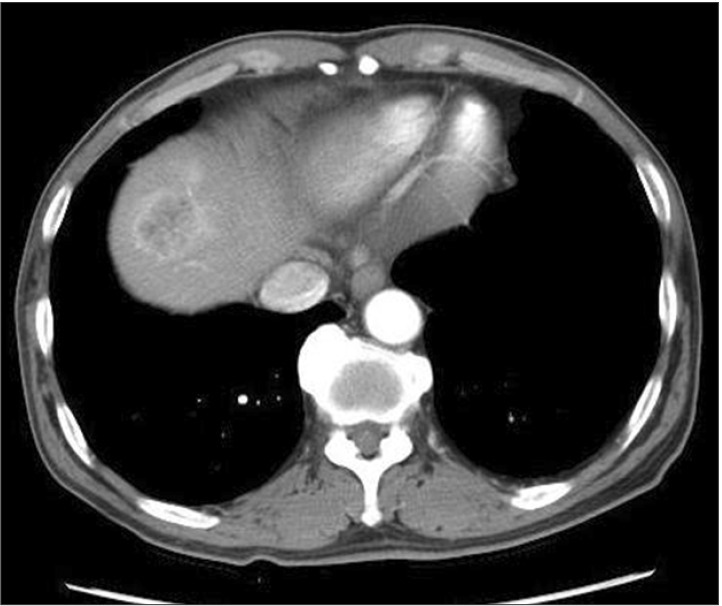 An abdominopelvic computed tomography scan showing a 3.5-cm-mass in the liver that demonstrated strong enhancement following the intravenous administration of contrast material. 본문에는 "1.7-cm superficially elevated (IIa)-type of EGC"로 씌여 있지만 EGC IIa+IIc라고 보는 것이 좋겠습니다. IIa는 깊은 경우가 드물지만 IIa+IIc는 깊은 경우가 많습니다. 전혀 다른 종류라고 보는 것이 옳습니다. 내시경 조직검사는 moderately differentiated adenocarcinoma였는데 ESD 병리는 moderately to poorly differentiated adenocarcinoma로 되어 있습니다. 아마도 mixed type이었던 것 아닌가 추정됩니다. Mixed type은 pure type 보다 좋지 못합니다.